Hotel accommodation near Vientiane's Mekong River, architecturally is a mix of Asian, colonial French and modern western. Travel to Vientiane is usually via Wattay International Airport near the Mekong River and close to the Vientiane central business district or via the Thai Lao Friendship Bridge across the Mekong River from the city of Nong Khai in the province of "Nong Khai" Thailand which is 20km from Vientiane's CBD. Accommodation close Vientiane's CBD with internet, 80 TV channels, 4G mobile network, restaurants (or near restaurants) and swimming pools are common. More 4 and 5 star hotels in Vientiane being are being built every time I visit this booming city in central South East Asia. 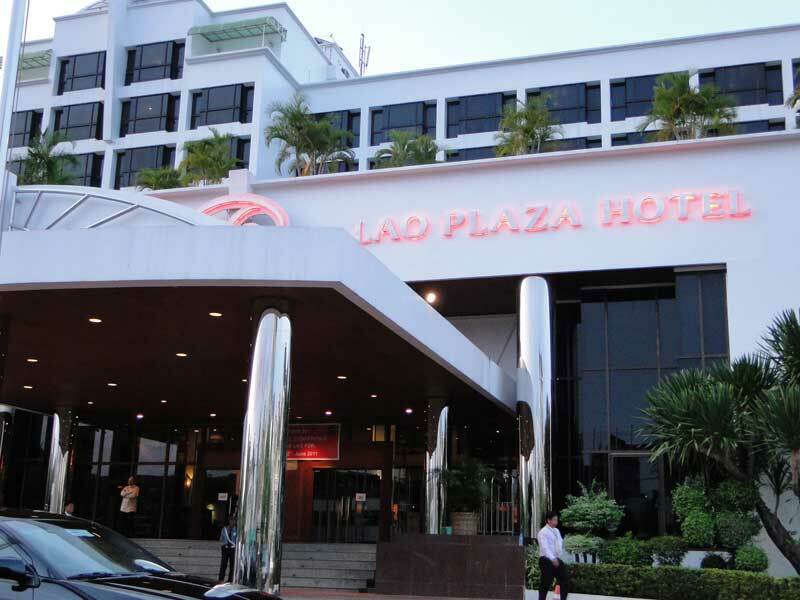 Laos is develping quickly and being a member of ASEAN and recipient of foreign aid, conference hotels are booked well in advance. Cheap home stay style guest houses are also near Vientiane's CBD and Mekong River. 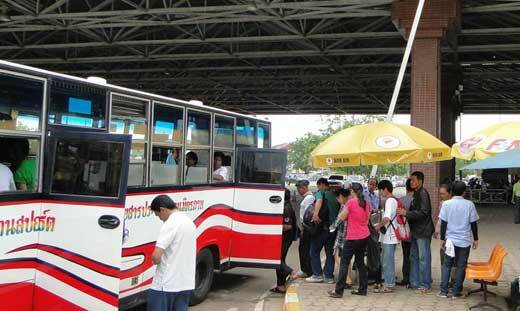 Many overland travellers to Vientiane catch big comfortable airconditioned coaches or the train from Bangkok. A stopover stay in hotel accommodation near the Friendship Bridge in the city of Nong Khai overnight is recommended, before and after crossing the Thai Lao Friendship Bridge. The bridge was funded by Australia and built by Australian companies. Some expats from as far away as Chiang Mai fly to Vientiane via Luang Prabang or park their car in secure parking at nearby Nong Khai before their "Thailand to Vientiane visa run". Signage near the Thai side of the border names the bridge as the "Thai Lao Friendship Bridge" whereas signage on the Lao side near the bridge names the bridge as the "Lao Thai Friendship Bridge". The nearest town to Vientiane is our home town of "Si ChiangMai", 400 metres directly south across the Mekong River from Vientiane, in the Thai border province of Nong Khai. I've had many romantic sunset dinners at restaurants on the bank of the Mekong River at Si Chiang Mai, listening to Lao music drift across the Mekong and watching long tail boats, cargo boats and the Vientiane dinner cruise boat ply the mighty Mekong. The new bigger Vientiane hotels near the Mekong River have great views of the Mekong River. Early in the monsoon season the Mekong River near Vientiane is so low that trucks drive halfway out into the Mekong from the Lao side to cart sand for building materials in Vientiane. Hopefully damming of the Mekong upstream by China won't reduce the Mekong to a trickle like the fate of many other once great rivers of the world. See photo of the Mekong River Commission building near the Mekong River in the slide show below of Vientiane. Language spoken in Vientiane is Lao, Laotian, (Lothian). It is a form of Isaan (Isan, Esaan) which is widely spoken in nearby northeast Thailand. Tourist visa upon arrival at Wattay Airport costs about $40. Prices vary according to nationality. Above: photo of 50 cents, Friendship Bridge Crossing bus embarking at Nong Khai to Vien Tiane. 1300 bhat immigration fee to enter Laos. Travel to Vientiane CBD by bus or airconditioned 500 baht taxi / mini bus from the Lao immigration check point near the Friendship bridge. We hired a good driver named Sonenal Pin and air conditioned mini bus tour van for 2.5 days sightseeing and Vientiane / Bridge transers for 1,900 baht. 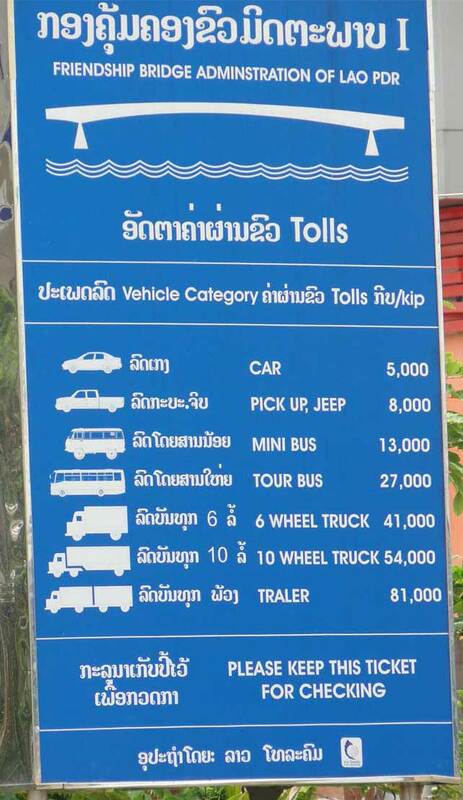 If you're driving to Vientiane, road signs display Vientiane spelt "Vien Tiane" Click photo below for Friendship Bridge tolls for self-drive vehicles in the Kip Laos currancy. On the Lao side of the Friendship Bridge the tourist bus crosses over to the right hand side of the road. Small motorbikes, pedestrians and bicycle are excluded from crossing the Friendship Bridge. A friend of mine was permitted to drive his 250cc motorbike over the bridge. Click to enlarge the blue Friendship Bridge toll sign below. Negotiate price of not more than $1 per kilometre for tuktuk travel in and near Vientiane. Click information link above on how to apply for Thai visa renewal or Thai visa extentions at the Thai embassy in Vientiane. A must visit to the Lao War Museum in Vientiane will confirm that Laos is a communist country. The Lao War Museum is large and full of many interesting Vietnam war exhibits. More bombs were dropped on the Plain of Jars and on the Ho Chi Minh Trail in Laos than all of bombs of WWII. We saw the war museum with a mechanic from Kalgoorlie who's working near the Ho Chi Minh Trail. He's seen many huge craters and daily there are finds of unexploded bombs near the Australian copper/gold mine near the Vietnamese boarder with Laos. Eye candy in uniform are female military War Museum attendants. The chorus "women in uniform" kept ringing in my head. Swim and enjoy the cool jungle environment of waterfalls near the Mekong River near Vientiane. The videos below were filmed 18km, up the Mekong from Wattay international airport near the Vientiane CBD. You'll need your passport to cross the Mekong River into Thailand to get to these beautiful waterfalls. Big dragon boat races are held in September on a swift flowing Mekong River in towns near Vientiane. See photo of dragon boat racing on the Mekong near Vientiane in the video below. Gamble in Vientiane at the The Dansavanh Nam Ngum Resort Casino located at Route Luang Prabang, Vientiane. Day Mekong River Cruise from "Si Chiangmai" near Vientiane. If you're in Vientiane in the second week of hot April, go swimming in the Mekong River near the Thai Lao Friendship on the Thai side near Nong Khai town. Bring a big water pistol or super soaker for the famous Thai festival of Songkran near Nong Khai. If you're not in a car with the window up, you WILL get wet on this day trip near Vientiane. Arch near grand presidential palace. Banks of the Mekong River viewed from near a large Laotian liberation fighter's statue. Bus tour of waterfalls near Vientiane. The Wang Nam Mok waterfall is 18km near Vientiane. Get a cheap $10 massage in Vientiane. Visit restaurants, bars and nightclubs in Vientiane. Visit the local Vientane markets. The bustling market is a very interesting eye openner as to how Isaan people of Vientiene shop, prepare food, do business and see unusual foods. There's the tourist evening markets near the Mekong and there's the peoples market near the main Vientiane bus terminal. Since the Pathet Lao communists took control at the end of the Vietnam War, Laos is a communist country, though there is some disagreement of this term. Officially the "People's Democratic Republic of Lao" PDRL or Laos (as the west terms the country name), does not give the impression of equality of all it's people. Booming Vientiane, with new hotel accommodation developments, advertising billboards of many western brands, mostly imported from China, grand buildings, luxury hotels, casino and luxury cars are everywhere. Cheap compact four door, left hand side drive sedans cost about $9,000. GDP is about US$1,700. Wealth in Vientiane is offset by poverty in provinces. Many petrol stations in Vientiane are Vietnamese. 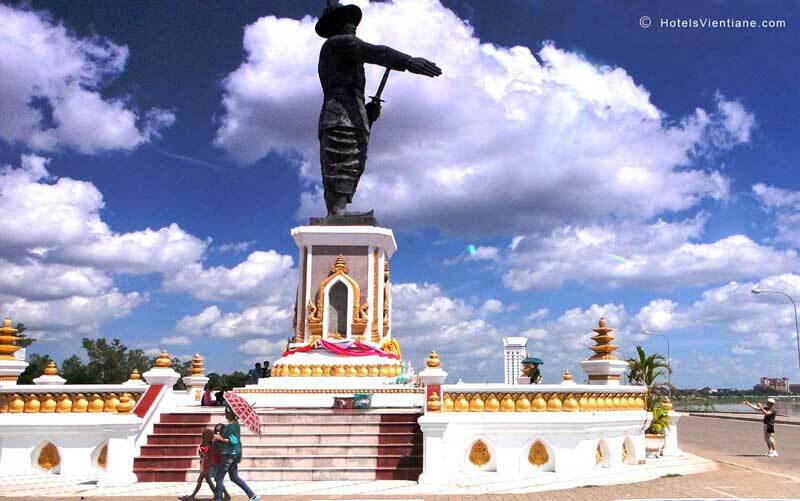 Large statue near the Mekong River of a 17th century Lao King who defeated Thai armies to keep Laos independent till French rule. There are many good Vietnamese restaurants near Vientiane's CBD. We ate a lot of great Vietnamese food at the Family Hotel. The green vegetable dish is recommended but avoid the tofu. As a former French colony there are still some French and other European style restaurants to enjoy near the Mekong River or bustling streets of Vientiane. There are bars near Vientiane's centre with beautiful Laotian women but my wife wouldn't let me go. Restaurants near the centre of Vientiane dish up good food but as in most capital cities, is double the price of restaurant food on the other side of the nearby Mekong River in Si Chiang Mai. A legacy of the Vietnam war was displacement of many Laotian families. One of the pleasures of life is giving. I gave 5 years in the prime of my life as an Australian Volunteer Abroad. A poor but great experience. Try spending a time visiting orphanages near Vientianne. Check out accommodation and other facilities. Interact with orphans near Vientiane. You'll be inspired by the children of Vientiane. Near Vientiane I met a Buddhist monk from Perth Australia. We travelled over Friendship Bridge by bus into Thailand and then tuk-tuk to Nong Khai border town. Gavin gave up a well paid boilder maker job in Australia to do volunteer welding work at his forest monastery retreat in Thailand. Buddhist monks there provide retreat accommodation and therapy for drug addicts. Gavin hopes to set-up similar retreat accommodation and therapy in Perth. Forest monks rarely travel and wear brown robes. Hotel Accommodation Near Vien Tiane CBD and office of Vietnam Airlines in Vientiane. Airline flight arrival time information in map below.